In milling, we bought it to use an odd diameter end mill. Because I used it in a small milling cutter, I was worried about how much accuracy is required but I bought this item after considering the price. I can not judge the quality of accuracy, but it is enough for our use. This review is about item#38851671. When using a collet chuck with a narrow body with a narrow processing range it is useful because you can grasp a 16 mm shank diameter knife. This review is about item#6744421. 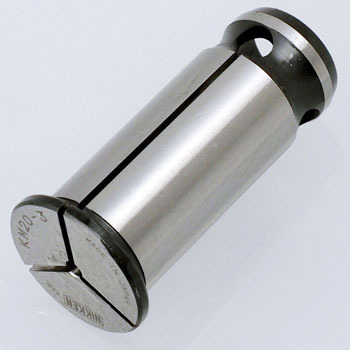 Although it seemed not to be used for lathes, it can be used without problem for work holding with a lathe. I think that it will be saved if it can be bought cheaply in a set because it is a thing with several pieces of size. This review is about item#8218034. It is stable use, accuracy is no problem. This review is about item#6744534. Nikkyo is easy to use. Although the finish of the product is good, it is difficult to pull out the nail when it is pulled out from the holder. This review is about item#38852231. It can be used with confidence. This review is about item#08217991. Purchased to grasp the workpiece rather than the end mill with 3 chucks. Although it is divided into three in the image, in reality it is not usable in six divided from both sides ... I hope things that are not common images if possible. This review is about item#38852265. There was MADE IN KOREA written in the product. It should be clearly stated in the explanation. It seems I was deceived, I do not feel like it. This review is about item#06632001. There is no problem with retention and workability. This review is about item#06744367.